Wikimedia Commons has media related to Americas. 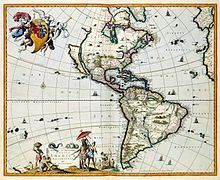 The Americas (or America) are a landmass that include the continents of North America and South America and all nearby islands, including the Caribbean islands. They cover 8.3% of the surface of the Earth, and 28.4% of its land area. The Americas are located in the Western Hemisphere. In history, they have also been called the New World. Most people consider the countries in Central America to be part of North America instead of South America, but people in the countries of Latin America consider the Americas to be a single continent. ↑ "Real Academia Española". Lema.rae.es. Retrieved 30 September 2013. This page was last changed on 16 July 2018, at 12:05.